I hadn't planned on writing anything about my last trip. There wasn't much to it. But then I realized what I had just done was the very thing this blog promotes and encourages. Always travel with fishing gear: Be prepared and grab an opportunity to fish somewhere new, even if just briefly and opportunistically. I learned some new water, took notes for next time, and caught fish in the process. 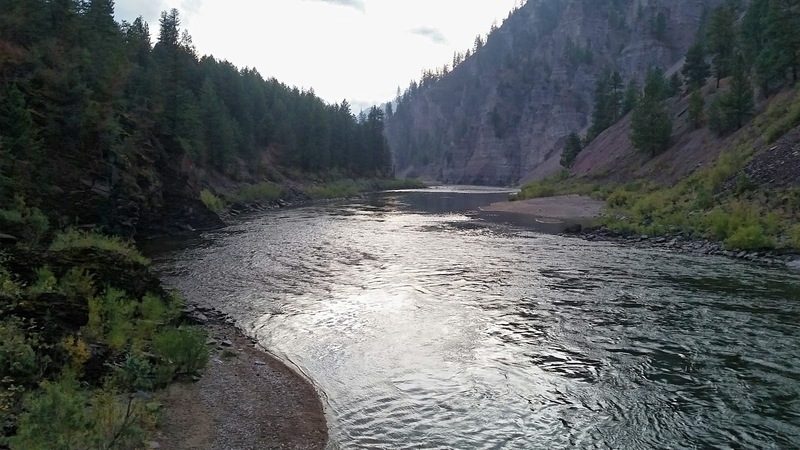 Travel for work took me along the Clark Fork in Western Montana. I've never fished it that I recall. Maybe a cast or two at some point. A fly rod and a couple spinning rods were at the ready in the back seat. The first evening I had about an hour of daylight remaining as I intersected the river on my way to a hotel for the night. I strung up a long spinning rod - anticipating trout and expecting to benefit from the extra reach in the swift, big water - and slid down a bank under one of the numerous I-90 bridges. I readily picked up some chunky pikeminnows, watched twin whitetail fawns play like kids, saw an osprey grab a fish, and marveled at a glowing rainbow on the tail end of a passing storm. After 30 minutes I eased on down the road and dropped in again a couple miles downriver. I caught a feisty 16-inch rainbow and a few more pikeminnows. The rainbow nailed a jig along a rock wall sloping back under my feet. 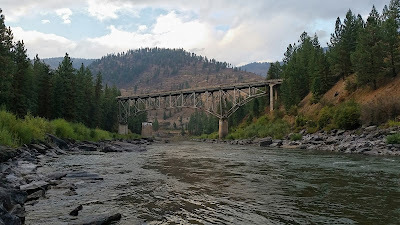 The next day I was much further downstream, down in a warmer water fishery, and found myself with about another hour of available time. I beat around trying to find access and bailed out in a likely looking place where ownership was apparently public. This time with a shorter spinning rod for working topwaters and jerking jigs in slower water. 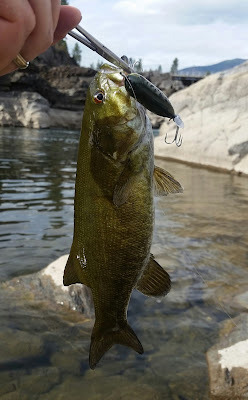 I targeted smallmouth bass and caught several smaller ones. Nothing over a half pound. Pike were in the back of my mind, but I never saw any. I was fishing a 4lb mono but had a spare spool filled with a super line I could swap out if pike showed up. I started out with a good "attractor" jig that would generate hits from anything I expected to be here - bass, pike, maybe trout. Once the smallmouth showed their presence, I switched to a Heddon Torpedo to force some surface bites. Had some of my first topwater bass action in quite some time. I switched back to a jig when I came across a nice run with some depth that was begging to be probed. I bounced bottom with some slow rolls of a 1/16th-ounce bait. 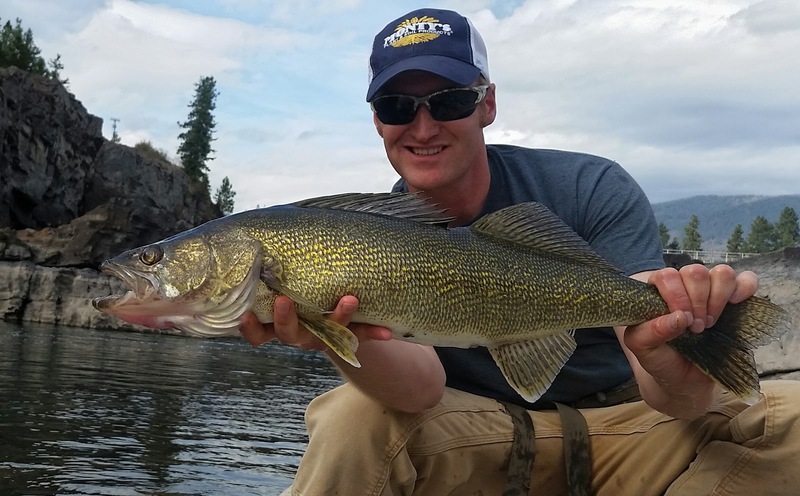 Slow water, slow flutter with a lightweight lure. I felt a big pick-up on the end of a drop, ensured tension contact, and set the hook into some poundage. The fish stayed put, then throbbed with pulsing thrashes of a fish with heft and length. It didn't take off in a blistering run like the bass or pike I was anticipating. Brown trout crossed my mind, but when I saw the trademark white tip on the tail I realized my quality walleye streak was continuing. I fished a total of a couple hours within a 24-hour window. Caught four species. Caught what I targeted and some bonuses. Was blessed with a surprise trophy. I could have simply driven by. But that's not me. True to form I squeezed in an opportunity and capitalized on it. It panned out in big ways. I saw new beautiful places. I breathed in the smell of forest and river - a break from the hum of tires on the road. And now there are a couple more places in my hit-list for later, with some ideas of species to target - along with other gorgeous water I drove by and drooled over but didn't get to sample that's now tucked away into memory.